At Silencio I complained that the VIP crowd was too fashionable to do anything so uncouth as dance to some catchy Asian pop, lest someone’s gangnam a-go-go be deemed outdated. But on Sunday I attended a completely different musical gathering – as relaxed as Silencio is pretentious; free and open to the public where David Lynch’s nightclub is pricey and exclusive; sur l’herbe and sous le soleil, hours before the underground bar opens its doors to the well-heeled, well-coiffed clientele. And still, despite two stellar DJ sets, nobody in the crowd of 300 revellers danced. Not because they were too cool; simply because they were too lazy. 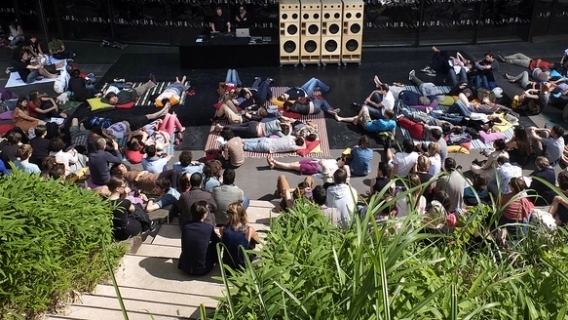 This was, after all, a siesta, held annually on every Sunday in July, during which the Musée du Quai Branly invites music lovers into its sprawling zen garden to listen “à l’horizontale”. That is, to stretch out and veg out while the DJs keep the tunes fresh as the surrounding greenery of the Théâtre de Verdure. 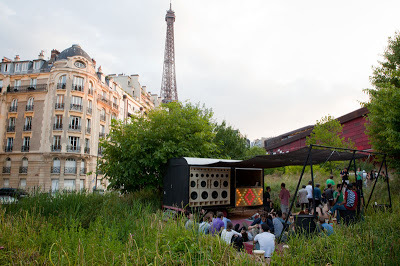 There are plenty of idyllic parks and public spaces where you can claim your own patch of Paris to doze on in the dappled sunlight – the Jardin du Luxembourg and the Canal St-Martin among my favourites – but there’s something special about the Quai Branly museum’s vast bamboo gardens that make them the ideal venue for Les Siestes Électroniques. 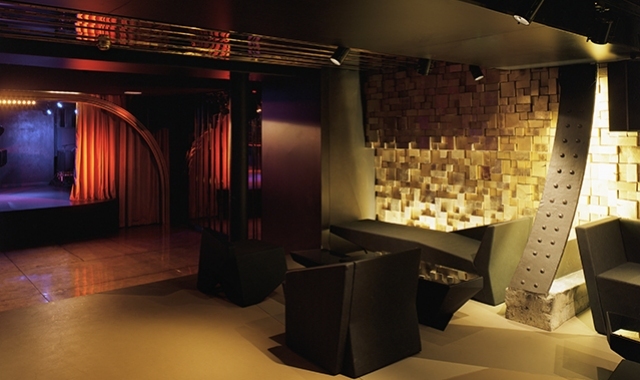 Designed by the renowned botanist Gilles Clément as a space “conducive to meditation and dreaming”. Their mascot is a tortoise, the very emblem of laid-back tranquillity. As soon as you penetrate those long glass partitions that seem to stretch on forever, you’re shielded from the urban noise and pollution in an oasis of plantlife as exotic as the contents of the museum. Fittingly for a museum that goes by the motto “là où dialoguent les cultures”, the DJs and musos chosen for these Sunday sessions were of the sort that dabble in exotic sounds, and were invited to dig around in the Quai Branly médiathèque recording archives for music from five continents to integrate into their own styles sortis des sentiers battus. This year’s line-up for Bastille Day included one of my favourite French adventurers, Pierre Bastien, working his sonic wizardry on African recordings sampled from the museum, accompanied by his robotic ensemble Mecanium on his own collection of instruments from Nigeria, the Ivory Coast, Morocco and still farther afield. Weird, I know. And the effect is hypnotic; sublimely soporific but never boring. But on the final Sunday a trip through Asia was just the ticket with Gangpol, who served up a mai tai of Cambodian funk, Filipino anti-colonial anthems, coquettish Thai duets, tacky Taiwanese pop, Cantonese mambo, and whatever other delights fell from the shaken coconut tree — along with the occasional French spoken-word radiophonic interjections. Through half-closed eyes I could see the mild-mannered, silver-haired gentleman behind the decks smile, jive and air-drum his way through the hour-long Asiatic reverie. He faltered only once, explaining to the crowd that a “coccinelle” (ladybug) had landed on the disc he was spinning; gently he coaxed it onto the loudspeaker. I was enjoying the music too much to nod off, but not enough to offer myself up as the sole dancer in a sea of bodies in sweet repose on mats and cushions provided by the museum. The whole shebang ended with Air on the G String arranged for marimba – Bach’s is a universal language, after all. Les Siestes Électroniques return to Paris July 2014. Stay tuned for next year’s offerings. In the meantime, head to the Musée du Quai Branly and check out the L’Invention des Arts ‘Primitifs’ exhibition, running until 22 September, 2013. 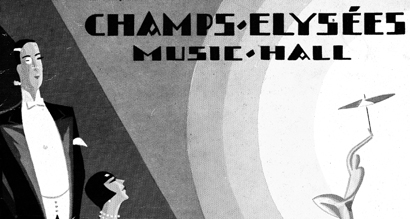 The Théâtre des Champs-Élysées had its first succès de scandale a hundred years ago just weeks after it opened, when the world premiere of Stravinsky’s ballet The Rite of Spring incited the most infamous punch-drunk riot in the history of classical music. 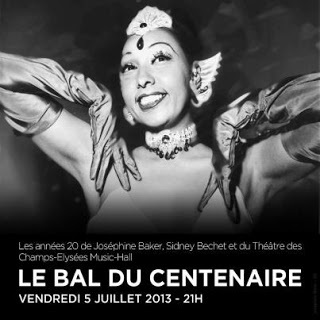 In 2013, concert halls and theatres the world over are commemorating that seismic moment, but Parisians haven’t forgotten where it all started, judging by the crowd that turned up dressed to the nines for the venue’s Bal du Centenaire in the first week of July. No brawls or virgin sacrifices on this balmy Friday night: the theatre celebrated its birthday with a very different danse sauvage from the annals, tipping its top hat to Josephine Baker’s 1925 Paris debut (and riding on Baz Luhrmann’s Great Gatsby coattails) with the salle de concerts transformed into a roaring twenties music hall for one night. To make it all about me for a moment, as all good bloggers must, I felt a particularly personal sense of occasion: after all, it was a sort of premiere of my own in the city’s most elegant Art Deco theatre. There I was, barely unpacked a mere five days after relocating from Sydney to a 20m2 studio in Montparnasse, and my French marraine fée was whisking me off to a ball — more Cendrillon than La Baker, a debutante stepping out in Parisian society. That said, admittedly, I stepped out with two left feet, and if I scandalised anyone it was by tripping over them. Doing their best to give me a wide birth as I stumbled to and fro, Parisians of all ages twirled, shimmied and rumbaed their way around the planche de danse constructed on the stage. One fleet-footed, silver-haired fox took pity and dipped me — that is, turned me dramatically upside down. Pearls, fringed hems and Edith Sitwell turbans brushed up against me. (Sadly, no banana skirt in sight.) 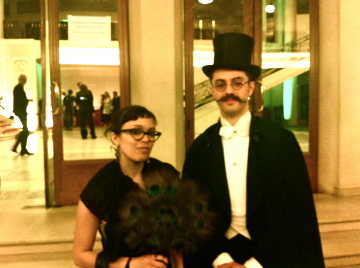 I fanned my sweating man-bag with peacock feathers as he sank into a plush velvet seat; my heart sank when I spied two girls of around ten years old apiece who were not only better dancers than me but also more chicly attired. The band was so taut and energetic that it hardly mattered. Windman Laurent Dehors’s nine-piece Tous Dehors had us kicking up our heels in authentic 1920s style, from the inevitable In the Mood via “un petit tour de Carmen” to Zez Confrey’s novelty charmer Kitten on the Keys (the latter’s piano cascades played by tubaist Bastien Stil, alternating comically between keyboard and hulking brass). On the other end of the size spectrum, I was delighted by Damien Sabatier’s solos on what I initially thought was a tiny tin whistle but turned out to be a “graille” (catalan oboe). During a late intermission, waiting for the deuxième danse DJ set to get underway at midnight, revellers took to dancing in the street while front-of-house staff in top hats and capes sashayed across the marble floors inside. But the elation didn’t last long; Bart & Baker’s jazz remixes were old-fashioned (and not in the good way), Véronique Hubert’s video projections lamentably amateur. It was unclear what age bracket the theatre hoped to attract. 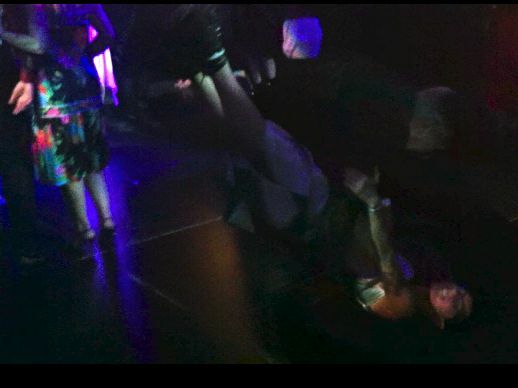 Dancers dragged their feet. This Cendrillon promptly turned into a pumpkin. All night, the spotlight from the Tour Eiffel remained fixed on the theatre, one icon illuminating another. Joyeux anniversaire. Things have calmed down a bit since The Rite of Spring premiere, then, but the Théâtre des Champs-Élysées remains one of Paris’s classiest and most beloved.